PAF! BOOM! Once again, KUTIKLUBI will kickstart Helsinki Comics Festival. This time the club is organised at LéSpace in the Vallila area. On stage RISTO, JYRKI NISSINEN & ISOTISSINEN and OLIMPIA SPLENDID. 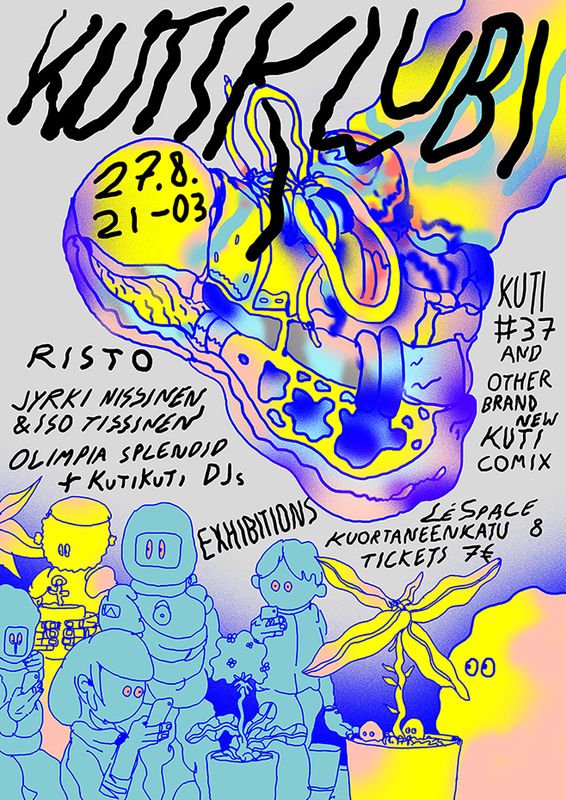 In addition, KUTIKLUBI will witness the release of KUTI #37 and myriads of other Kutikuti-related comics. The walls of LéSpace will also feature two exhibitions by Kutikuti folks. RISTO, hailing from Tampere, was introduced to music-abusing people in the mid-noughties with their hyperintensive paranoia-pop. The quartet’s quirky tales about jacking off at home, travelling in space inside one’s head, and missbehaving comic book characters where totally unheard-of in Finland. Risto’s latest record, II (2013), expanded their expression into scifi-like worlds and, on the other hand, even deeper into humanity. In 2015, Risto is still a unique treasure. JYRKI NISSINEN & ISOTISSINEN is a two-headed rock ‘n’ roll beast of Finland’s numero uno Underground aficionado, Jyrki Nissinen. This animalistic duo relies on the rock-hard dynamics of riffing and heavy beat. Aside from his comics, Jyrki Nissinen is known from groups such as Seksihullut and Jumalan ruoska. OLIMPIA SPLENDID, established in 2010, is Heta’s, Katri’s and Jonna’s iconoclastic trio. Their raw but hypnotic music forces the listener to slow down and focus. This year Olimpia Splendid have released their debut album. The members are also known from, from example, Toblerones, Hertta Lussu Ässä, Hockey Night, and Kuupuu. Too many fall. Where does it come from, the need to mock the fallen one? Is the one who barks safer when he says that being poor is one’s own fault, the end result of the poor’s unpleasant features? Hate speech obstrucks empathy, leading to a situation when one does not have to look the poor one in the eyes. The exhibition features pages from the coloring book and a hate speech collage. Also, a possibility to color.